Do you recognize any of these toys??? The little yellow cart, on the top right-hand side, is very soft plastic. And the President coins on the bottom row don't mention the "Mystery club" or anything about Cracker Jack. Here are couple of close-ups. The backs of the flicker cards do not say anything. The stippled fish charm looks like a C Carey Cloud production, but it is puffy and two sided, not flat like the other charms. Last edited by Ginger on Thu Aug 06, 2009 3:54 pm, edited 1 time in total. Re: Do you recognize any of these toys??? Second Row: Y, N, ?, N, ? Row 2 # 4 is part of a set, I forget the name but it should be marked on the scissors. Row 3 the knives could be, the coins are not - probably cereal premiums from the 50s (I somewhat remember these as such). Here's more information. Your top row leftmost is a hard-to-find CJ centrifugal force bead game. A definite keeper! The 2 tilt cards to the right are likely not. Those tilt to and fro cards are very similar to the CJ ones. They were often inserted in rings, small plastic television sets and other items of the era. Often they are marked Vari-Vue on the back. I will look more on the other top row items. The second row leftmost is a snap-together acrobat man. However, the trapeze (small plastic rod piece) that goes through his hands is missing. In the 2nd row, the collie Cracker Jack. As Larry mentioned, the scissors may be. In the 3rd row the chick left most is not. I agree with Larry too that the coins are not. The knives and teepee item I will defer to other CJ expert opinions on. I can't see the gold coins close enough to tell if they are like a set I have, but they look like a set (lord only knows where they are) that was given out by Sinclair gas stations in the 1960's. You got one coin each time you filled up with gas and put them into a piece of cardboard that had a hole for each coin. The coins themselves didn't say anything about Sinclair. Ginger, send me a larger scan of front and back and I can tell you if yours are from that set. Also, in an earlier post you scanned some vehicles that are a little too big for Cracker Jack. I have seen the same ones for sale several times at shops and flea markets marked "Roadway" by the dealer. I don't know anything else, or who Roadway was. Here are a couple pictures of the snap-together trapeze artist (man) showing the trapeze - a front view and side view. It looks like your trapeze artist man has "a little something extra" on his legs Ginger! Greetings Larry, Gail, and Cyndy! Thank you all for taking the time to help me out with these toys. I have had them for over a year and never could find any information about them. But as soon as I joined the CJCA and started to come to the website, I have learned so much! Everyone has been so knowledgible and so helpful. I really appreciate it. Larry, your input means a great deal to me. I have completely *WORN* out your "Cracker Jack Toys" book. The binding has split and several pages are falling out due to such extensive use! Here is some more information about the scissors and knives: The scissors say "INTERCAST" on them. The red knife says "JAPAN" and the yellow one says "HONG KONG". Does this extra info make them Cracker Jack toys or just knock-offs? Gail, thank you once again for your valuable input as well! I definitely set aside the little bead game. My little acrobat is joining my other misfits toys that are missing parts. I was looking at your picture of the snap-together acrobat and I see what you mean about mine having something extra on his legs! It looks like the posts weren't snapped off. Perhaps I should post him on the thread about extra stuff! Cyndy, hi! Thanks for your input! I appreciate it! I tried to get a bigger scan of the coins front and back but all my efforts produced blurry pictures. Also, thank you for the info on the "Roadway" toys. There were mixed in a box filled with other Cracker Jack items and I have always wondered about them. I love the fact that the leg on the acrobat is identified as such. Otherwise, it could be mistaken for a long earring?! The Intercast toys are NOT Cracker Jack. 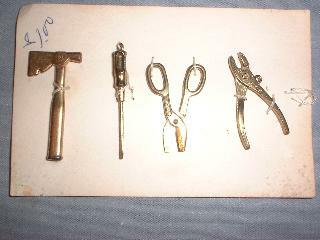 The complete set consisted of 10 working tools. I am attaching a scan of 4 of them. The pliars, knife and scissors are cute and wind up as dollhouse miniatures or in a small doll wardrobe. Thanks for the nice words on the book. I had to cut the binding off one and punch it for a comb binding so I could flip the pages and have it lie flat. FYI next month I will be releasing a new book on CD only. It does not have pictures (I sold my collection before I could photo it), but the descriptions should be adequate. A total of 15 years of updating and correcting. More info in the thread for "Items for Sale, Trade or Freebies" then "The Prizes of Cracker Jack." The new book is about 600 pages, more info on the other thread. The coins may also have been cereal premiums, I have several somewhere - don't remember what the obverse side has; but they are not CJ. By the way, I have LOTS of items that are NOT CJ, so don't feel bad. I also have hundreds of "parts" of put-togethers, etc. Had in my collection just the cover or an early 8-page booklet. Keep saving stuff until we get the complete version. More info: The Intercast scissors was manaufactured by Gries Reproducer Corp. Gries was a diecasting company that also did the casting for Topper in the early 70 for their Johnny Lightning line (not the later 1994 onward Johnny Lightnings) These were packaged in vinyl pouches as giveaways for various companies and also packaged by the Adams company that sold magic tricks as well (see picture) The adams package has a 1958 copyright date on it. I have also seen a small envelope marked with Gries Reproducer Corp that had a few of the tools in it and had advertising about their company. The envelope may have been a give away to potential diecasting customers.